From individual grains to desert dunes, from the bottom of the sea to the landscapes of Mars, and from billions of years in the past to the future, this is the extraordinary story of one of nature's humblest, most powerful, and most ubiquitous materials. 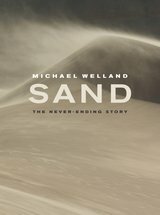 Told by a geologist with a novelist's sense of language and narrative, Sand examines the science—sand forensics, the physics of granular materials, sedimentology, paleontology and archaeology, planetary exploration—and at the same time explores the rich human context of sand. Interwoven with tales of artists, mathematicians, explorers, and even a vampire, the story of sand is an epic of environmental construction and destruction, an adventure in staggering scales of time and distance, yet a tale that encompasses the ordinary and everyday. Sand, in fact, is all around us—it has made possible our computers, buildings and windows, toothpaste, cosmetics, and paper, and it has played dramatic roles in human history, commerce, and imagination. In this luminous, kinetic, revelatory account, we do indeed find the world in a grain of sand. Michael Welland is a geologist who has worked around the world in the energy industry. He is a fellow of the Geological Societies of America and London and the Royal Society for the Arts and Commerce.